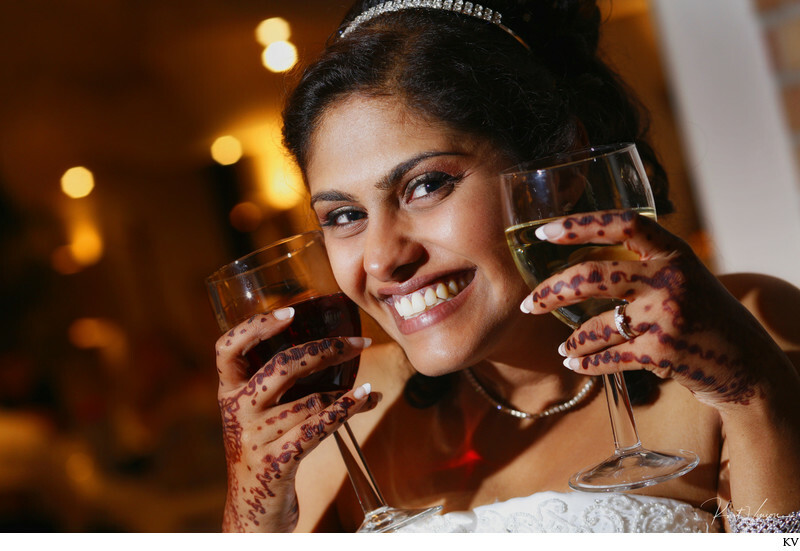 The bride and her wine - time to party - from Neera & Anko's Prague wedding party. With family & friends joining them from all around the world, Neera & Anko's wedding was a very lively and colorful affair with both a traditional wedding ceremony as well as an Indian ritual – something for both sides of the families. Later after dinner at the stylish restaurant Atis House (which is an architectural delight) and the traditional cutting of the cake, our couple got down with some thunderous Indian dance music that had everyone on the dance floor tearing it up. As weddings go, Neera & Anko’s will be one of the highlights of our year as there were so many beautiful moments of a young couple that is truly in love with each other and their family & friends. Keywords: Bride (81), Henna (3), Indian bride (3), party picture (3), wedding (36), wedding photos (1317), wine (3).